RHRLI wants you to know that not all hair transplant procedures are created equal. We’re the only hair loss treatment center on Long Island which has what we consider to be the best permanent solution available today. It’s called the ARTAS® System and it is a minimally invasive procedure that employs robotic technology to give you a healthier head of hair. RHRLI helps patients every day and we want to tell you about the advantages of minimally invasive surgery. A hair transplant using the ARTAS® System is called a follicular unit extraction. ARTAS® is the most advanced FUE technique because it employs a robotic arm as opposed to handheld devices employed in other FUE procedures. The robotic technology allows our board-certified surgeon, Dr. Baiju Gohil, to transplant donor hairs with more precision than any other transplant available. An ARTAS® FUE procedure is a far cry from the other type of procedure that’s out there called Follicular Unit Transplantation (FUT). This procedure, also called strip surgery, is far more invasive than FUE. According to the ARTAS® website, robotic FUE procedures target individual donor hairs with precision while FUT involves a strip of scalp being removed from the back of the head. FUT patients usually require prescription pain medication after the procedure is over. And a possible long term side effect is nerve injury. Other side effects of FUT include numbness, tingling scalp tightness and lingering pain. Patients who’ve undergone FUE with ARTAS® sometimes need acetaminophen after the procedure is over. 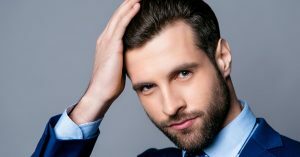 Your hair will maintain a natural appearance once you’ve had the robotic hair transplant, but FUT patients will be left with a scar that will be visible and runs horizontally across the back of the patient’s head. Because of this scar, FUT patients often require longer hair styles after the procedure is over in order to conceal the scarring. ARTAS® patients have more freedom in how they wear their hair following the transplant. Recovery times are also shorter if you undergo the ARTAS® procedure. Most robotic FUE patients are able to sleep comfortably without any pain in the donor area immediately after the transplant. You’ll be able to go back to work and be able to get back to everyday activities like exercise in just a few days. FUT patients often have difficulty laying on the area of the scalp where they have stitches following the surgery. They’re also often placed on restricted activity that can last up to several weeks after the procedure. As you can see, there are very strong differences between the non-invasive procedure you get with ARTAS® and RHRLI. Our patients rarely report major pain and have much quicker recovery times. Invasive procedures like strip surgery can cause more pain, more inconvenience and longer recovery times. To learn more about the ARTAS® system and RHRLI, contact us today. Previous Post: « Too Young for a Hair Transplant?